The Jungle Book is a live-action adaptation of Disney’s famous animated film, The Jungle Book(1967). It is also based on Rudyard Kipling’s novel of the same name. 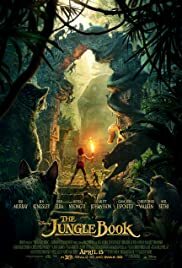 Mowgli(Neel Sethi) has lived in the jungle, for as long as he can remember. In the jungle, he is raised by a pack of wolves, led by Akela(Giancarlo Esposito). A wolf named Raksha(Lupita Nyong’o), is the only mother he has ever known. He has an ally & a friend, in a panther named Bagheera(Ben Kingsley). When the treacherous tiger Shere Khan(Idris Elba), opposes to Mowgli staying in the jungle, Bagheera has to return the man-cub to the man village. While on their journey, Mowgli & Bagheera receive help from a grizzly bear, named Baloo(Bill Murray). Now, it is up to Bagheera & Baloo to take Mowgli to the man village, safe & sound.